The Tarantula Nebula is an enormous emission nebula located in the Large Magellanic Cloud. The nebula is about 800 light years in diameter. It has enough mass to equal almost 500,000 suns. The nebula shines at magnitude 8.2. This nebula has a size of 40 arc-minutes by 25 arc-minutes. If the Tarantula Nebula was located in our own galaxy and was as close to us as the Orion Nebula, it would cover a significant portion of the night sky (about 30 degrees) and shine with the total brightness that is three times greater than Venus. 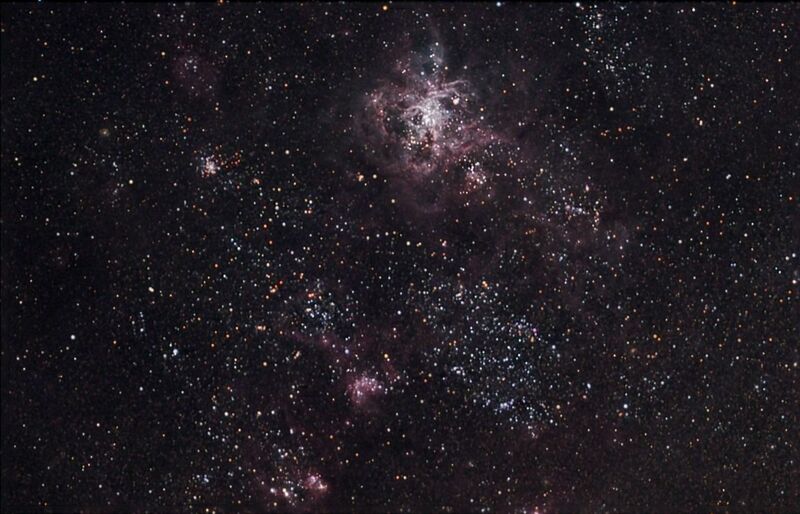 The Tarantula Nebula may be the largest emission nebula known in the Universe. Even though this nebula is located 150,000 light-years away in the LMC, it is a spectacular object to view through an amateur telescope. This is an LRGB CCD image taken with a Takahashi FS-78 refractor using an ST-8XE CCD. The telescope was carried on an EM-10 mount. RA: 05h 38m 37.4s Dec: -69d 04' 33"